verges on state of the art"; "one of those rare components that transcends strict solid-state or tube considerations by providing an accessible, listenable window into the music." Features Two-chassis tube preamp with "volume and balance controls, both sourced from Noble, and three inputs, which are controlled by toggle switches on the front panel." Tube complement is three 12AX7s and one 5AR4/GZ34; no remote control. Use "I was more than satisfied with the power cord that Song Audio includes with the SA-1 -- its a beefy 1.5-meter jobbie constructed from 98% pure silver with Wattgate and Marinco connectors." Value "I can envision the SA-1 converting more than a few solid-state diehards over to the tube camp. Are you one of them?" Theres this perception floating around the hi-fi world that in order to be a serious reviewer, you need to crucify a piece of gear every once in a while. Doing so, as the argument goes, shows that the reviewer is a discriminating individual, one who isnt afraid to make tough calls. The more negative the review the better the reviewer, and damn the consequences, some seem to think. Such guerilla reviewing is naïve at best and libelous at worst. First off, writing a negative review of a product that doesnt deserve it is just plain wrong; it needlessly hurts people who are depending on reviews for their business, and damaging the livelihood of another person in order to boost ones ego verges on the criminal. Further, my experience shows that theres just not that much bad gear out there. Even products that Im personally not especially keen on have redeeming characteristics that will most likely appeal to others, and to slam a product because of my preferences alone is, once again, a disservice to the manufacturer -- and especially readers. Why am I ranting on like this? I feel, perversely, that I have to apologize for producing yet another positive review of yet another outstanding product. I guess I just dont have what it takes to succeed in this industry. The product that sparked the preceding diatribe is Song Audios SA-1 tube preamplifier, which Ive been living with for the past several months. Cosmetically, the $4200 USD SA-1 will likely split opinion right down the middle. The frosted-acrylic front panels of the review unit are a distinctive departure from the obligatory 1/4" aluminum slabs. I quite like the look of the SA-1, but it seemed to polarize visitors, with some loving the appearance and others finding it, well, cheap-looking. Ergonomically theres not much thats exceptionally newsworthy about the SA-1. It has volume and balance controls, both sourced from Noble, and three inputs, which are controlled by toggle switches on the front panel. I found the operation of these switches to be a bit on the counter-intuitive side, as I seemed to constantly need to check which one activated the line versus the auxiliary inputs. But then again, I lose track counting out three cans of water when reconstituting orange juice. You most likely wont have any difficulties. The tube complement consists of three 12AX7s, and one 5AR4/GZ34 which handles rectification duties. The SA-1 is single-ended only, with all connectors consisting of high-quality, gold-plated RCAs. There are two sets of output RCAs, which will ease biamping or subwoofing. I found the chassis size of the two-box SA-1 a bit odd. I couldnt fit both pieces, each 11 3/4"W x 4 1/4"H x 9 1/2"D, side-by-side in my Target rack, and one of them looks a little lonely sitting on its own shelf. The umbilical that connects the two pieces together is quite long, though, so theres a reasonable amount of flexibility available for placement. I was more than satisfied with the power cord that Song Audio includes with the SA-1 -- its a beefy 1.5-meter jobbie constructed from 98% pure silver with Wattgate and Marinco connectors. The SA-1 weighs 22 pounds, with the power supply responsible for most of the heft. The SA-1 was generally very well behaved over the review period, exhibiting no turn-on or -off transients or other histrionics, with one notable exception. While the review sample was off being measured, Mr. Kim provided me with an early-production loaner so that I could continue my evaluation. Upon the return of the review sample, I proceeded to dismantle the loaner SA-1, and in doing so disconnected the power supply umbilical from the preamp proper. After removing the umbilical my hand brushed the chassis of the power supply and I was blasted with a shock that was obviously of significant DC voltage. Admittedly I neglected to disconnect the power cord from the power supply before disassembly, but the power switch was in the off position, and another user could conceivably repeat the order in which I disassembled the unit. I questioned Mr. Kim about this behavior, and he was aware that it could occur, but was of the opinion that all affected units had been accounted for and had received modifications to prevent its occurrence. I evaluated the SA-1 in my reference system exclusively. Here it shared shelf space with the Pro-Ject RPM 9 turntable, which was alternately fitted with Roksan Shiraz or Grado Sonata cartridges. Later in the review, the RPM 9 was replaced with a Michell Gyrodec Mk III turntable, upon which a Cardas-wired Rega RB250 tonearm is mounted. Signals went from the cartridge to a Sonic Frontiers SFP-1 Signature phono stage, which directly fed the SA-1. For speakers I used Hales Transcendence Fives, which were connected to an Anthem Statement P2 amplifier (review forthcoming) by Virtual Dynamics David-series cables. Interconnects were Virtual Dynamics David series, and a motley admixture of power cords saw varied duties. Everything was dutifully plugged into a Chang Lightspeed CLS6400 power conditioner. Theres something endearing about a good tube preamplifier. At the end-user/consumer level of the music industry, we audiophiles invariably listen for pleasure, and, in my experience, listening is always more pleasurable when there are tubes somewhere in the signal path. Im not necessarily talking about the overt, full-on, no-transistor-in-the-system tube lushness thats sickly sweet, although I must admit that I enjoy that too. Instead, Im referring to the very slight increase in dimensionality, depth, and tonal color that a sensibly designed tube preamplifier can provide. Whereas most solid-state preamps reproduce a signal in a literal manner, a good tube preamp will reproduce that same signal in a musical way. From the first listen I was immediately comfortable with the SA-1. Its sound drew me into the music, enhanced my listening pleasure, and gave me no indication that it was doing so by injecting any blatant euphonic additives into the sound. Strong stuff indeed. Although Son Volts Wide Swing Tremolo [Warner 9 47059-1] is not hi-fi by any stretch of the imagination, I often find myself returning to it, as it's an album thats flattered by any application of tubes. WST is considered alt-country, which, I gather, is a blend of country and straight-ahead rock. Theres an honesty to Son Volts music and lyrics that I find endearing, and the SA-1 eked out the meaning and emotion from this album, rendering the guitars distortion without adding any edge or subtracting any detail, and crisply resolving the depth around each chord. Via repeated listens to Wide Swing Tremolo, I slowly came around to the conclusion that the Song Audio SA-1 is one of those rare components that transcends strict solid-state or tube considerations by providing an accessible, listenable window into the music. So its not overtly tubey, and its not clinical. That makes the SA-1's sound kind of hard to pin down. There are some traits that do stand out though. The SA-1's presentation comes across as distinctly uncolored and thoroughly modern, thats for sure, and boy, oh boy, can it boogie! Medeski, Martin and Woods latest slice of groove is entitled End of the World Party (Just In Case) [EMI BTE 7243 5 95633 1 2], and here it sounds like the boys have finally found their voice. While I was partial to their Hammond B3/bass/drums shtick, it was starting to wear a trifle thin, and with this new album, they add some electronics and carve up some blistering music that gets your toes tapping. On "New Planet" I found myself turning the volume up louder and louder, an act thats becoming less frequent as I get older. The loping, start-stop bass is accompanied by razor-sharp, crunching guitar and Billy Woods crisply delineated snare, all boiling together with the funky '70s keyboards. The SA-1 not only kept each instrument discrete in its own distinct point in the soundstage (no small feat on its own), but also retained the coherency and rhythmic intensity upon which this track relies. Sophisticated tube preamps are supposed to be reviewed using delicate, dainty pieces of music -- string quartets or solo piano. The Song Audio SA-1 didnt herd me in that direction. Instead, the SA-1 made me want to listen to groove-oriented music of all descriptions. So moving from indignity to indignity, the next LP on the platter was Rage Against The Machines Battle of Los Angeles [Epic E 69630]. Again, cranking the volume to levels that I usually only listen to in the car, I proceeded to shake the mould off the dustcaps of the Hales woofers. Although (or perhaps because) RATM is made up of three very aggressive young men who might benefit from an anger-management class, I find their music amazingly cathartic, and I get a chuckle over the naïveté of their politics. Whatever. Anyway, this is a crass, abrasive recording with absolutely no audiophile merit, yet the SA-1 fully relayed all of the hate and malcontent, along with the very slight sense that these kids are hoping for something better from the world. While Battle of Los Angeles doesnt relay a huge amount of information about the SA-1s sound, the fact that I listened to the SA-1 with so much angular, beat-heavy, challenging music is a compliment of the highest order. The better a component is, the more I can indulge in music that's busy and abrasive. I also listened to a ton of more serious music through the SA-1, and had a smashing time doing so. The SA-1s fine way with rhythm is complemented by its imaging, which verges on state of the art, and this combination makes the SA-1 a natural for reproducing jazz of all types. Its been a while since Ive listened to Hank Mobleys Soul Station [Blue Note ST 46528], but Ive learned to put my trust in my fingers, which respond to commands from stereo components just like theyre being controlled by a Ouija board. "Put on Soul Station," the spirit within the SA-1 whispered, and who was I to argue? Mobleys tone is, in my opinion, just delightful. He bisects a straight line between Sonny Rollins right-angle fervor and Ben Websters syrupy sweetness, and the lack of tonal embellishment puts the focus directly on his melodic intensity. I love this album more for what it doesnt do. There are no gimmicks to get tired of, no blatant changes of tempo, and the whole album flows in a way that few jazz albums seem to be able to do. The SA-1 knew what it was doing when it made me play this LP. Mobleys sax attained a crispness off the bell that was at distinct odds with the dimensionality of the instrument as a whole. 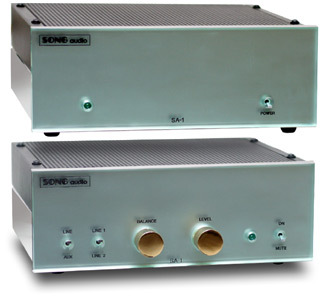 Where a typical, fruity-sounding tube preamp would emphasize the richness of the overtones at the expense of the outlines of the instrument itself, the SA-1 kept that distinct spatiality intact, while injecting just the tiniest bit of aura. The SA-1s presentation of Mobleys sax was as balanced as Mobleys instrument itself. Bloody good show! The SA-1s tonal balance was essentially neutral, and I was unable to discern any reduction of energy at either frequency extreme. The bass was firm and well delineated, and while not solid-state crisp, it had a reassuring and satisfying depth. My benchmark for bass performance these days is Duke Ellingtons Blues In Orbit [Classic Records/Columbia CS 8241]. While you wouldnt think of this album as a bass-evaluation disc, its an absolute torture test for clarity, extension and shading. The trombones use some of the same range as the walking bass on "Three Js Blues," and its easy for things to get muddied up. The Song Audio SA-1 displayed the appropriate amount of warmth and room decay along with that mastery of rhythm that I mentioned earlier, yet still managed to disentangle each instrument that was contending for my attention. Up higher in frequency, the SA-1 presents the midrange and treble in an uncolored manner, without excessive editorializing. Theres none of that jammy, second-harmonic embellishment that tube detractors so volubly protest against, yet -- dare I repeat myself? -- theres also no way youd mistake the SA-1 for a solid-state-preamp. If you own a turntable, please do all of us LP lovers a favor and pick up Classic Records reissue of Crosby, Stills, Nash, and Youngs Déjà vu [Classic Records/Atlantic SD 7200]. Hopefully strong sales will encourage the folks at Classic Records to reissue more works of this caliber. This is fantastic music that needs no introduction, and Classic Records has worked wonders with the sound. The Song Audio SA-1 reproduced Neil Youngs vocals on "Helpless" with a most admirable quickness and clarity, which allowed me to "see" further into the music and glean even greater pleasure from this song than I normally do. Coming right on the heels of the Emotive Audio Poeta ($4495), which is itself a fine example of the breed, the Song Audio SA-1 fit into my system as if it had always been there. These two preamplifiers sound much more alike than different, even if they look like two completely discrete species. Theres no getting away from the fact that the appearance of these preamplifiers will split potential customers into two groups, and there may even be violence, so polarized will opinions be. The SA-1 looks distinctly conventional beside the olde worlde, hand-carved Poeta. While the Song Audio SA-1 can fit pretty much anywhere -- two-chassis requirements aside -- the Poeta requires a dedicated top shelf, which might cause problems if you already have a turntable or top-loading CD player occupying that space. Sound-wise, the SA-1 is less obviously a tube preamp than the Poeta, which is surprising, as the Poeta is a hybrid design. Its not simply a matter of which preamp is more or less musical; its more like a different way of portraying the music. But that small difference may polarize listeners, in much the same way as the appearance of these two preamps likely will. I was hard-pressed to notice any divergence between these preamps in the bass, but there were differences from the midrange and up. The Poeta is slightly richer in the midrange and the treble, which adds a delicious, creamy texture to the music. The Poeta never overdoes it to the point where I could consider this lushness a coloration, and indeed its hard to notice, until directly compared to the slightly more neutral SA-1. If youre using a solid-state amp, as I am right now, the Poeta may very well be a better choice, as its additional richness will be welcome -- sort of like drinking hot chocolate on a cold night. However if youre using any sort of tube amp -- especially one that sounds rich, like a 300B-based SET design -- then the SA-1 would likely be a better choice, which isnt surprising, since Song Audio makes 300B mono amplifiers. These two preamplifiers also diverge in how they present images. Instruments are slightly more rounded and fleshed out by the Poeta, and reside just behind the plane of the speakers, while the SA-1 is more pinpoint in its presentation, with images a touch closer to the listening position. Again, your preference may well come down to the type of system in which the preamp will find a home. A dead-accurate solid-state system could certainly benefit from the Poeta, whereas the SA-1 might be better suited for a system that already has tubes somewhere in the mix. While neither preamp is inexpensive and both have lots of competition, including many models from other makers that include remote control, one thing is for sure: these two preamplifiers both uphold very high sonic standards and would be a swell addition to many systems. Although its probably not good for my audio-reviewing career, Im going to suggest strongly that you audition the SA-1 if youre in the market for a preamplifier, be it solid-state or tubed. The SA-1 walks a fine line between the euphonic and the neutral, deftly avoiding the temptation of adding excessive amounts of tube sweetening. With the SA-1, Song Audio has created a thoroughly modern-sounding tube preamplifier that crisply and accurately amplifies whatever signal its passed, and yet still manages to present music with that ineffable richness that only tubes can create. Factor in deep, rich bass, uncolored midrange and treble regions, and a distinctive appearance, and youve got a very high-quality preamp. I can envision the SA-1 converting more than a few solid-state diehards over to the tube camp. Are you one of them? Warranty: Five years parts, one year labor, 90 days for tubes.